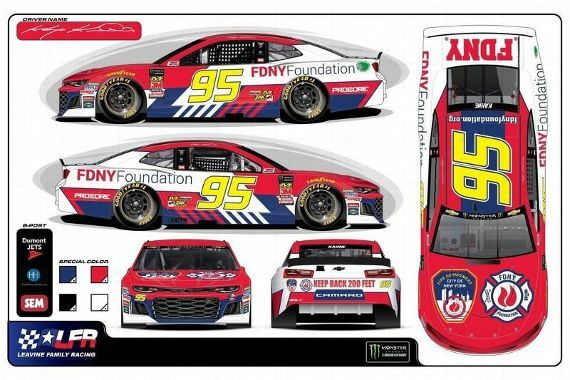 • SUPPORTING THE FOUNDATION: This weekend at Pocono, Kasey Kahne will run a special FDNY Foundation paint scheme aboard his No. 95 Camaro ZL1. • FDNY FOUNDATION: The FDNY Foundation returns with a fresh look on their home track. The FDNY exists to provide support to the men and women of the FDNY. Through donations and fundraisers, the FDNY Foundation provides critical items such as lifesaving equipment, fire safety tips and education for school children, and recruitment for the FDNY. • KAHNE BY THE NUMBERS: In 28 Monster Energy NASCAR Cup Series career starts at Pocono, Kasey Kahne has an average start of 11.5 and an average finish of 18.4. He’s completed 4,709 of 4,950 (95.1 percent) career laps, and has led for a total of 219 laps. Kahne has earned two poles, two wins, five top-five and nine top-10 finishes at the 2.5-mile track. • BACK TO THE BEGINNING: Kahne has a great relationship with the ‘Tricky Triangle”, achieving his first pole at the raceway on his very first attempt in 2004. In 2008, he also took the pole but went on to win his first Pocono race in the Pocono 500. • RACE INFO: The Pocono 400 at Pocono Raceway begins at 2:00 p.m. ET on Sunday, June 3rd. The race will be broadcast live on FS1, Sirius XM Channel 90 and MRN Radio.